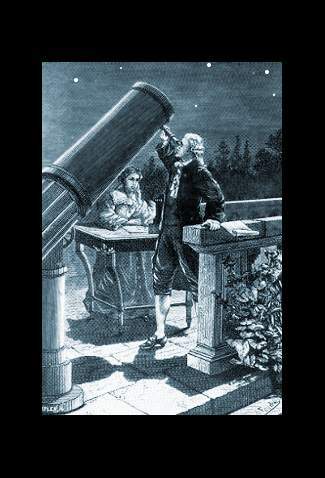 Caroline Herschel began her life in astronomy supporting the work of her amateur astronomer brother William. She was working with him when he discovered Uranus. She became the world’s first professional woman astronomer, her salary provided by King George III of Great Britain. The catalogue of nebulae she produced brought her the British Royal Astronomical Society’s 1828 Gold Medal – the first awarded to a woman. She personally discovered five comets, and rediscovered Comet Encke. Working as a team, William and Caroline Herschel increased the number of known nebulae from about 100 to 2,500. Caroline Lucretia Herschel was born in the German town of Hanover on March 16, 1750, the eighth child of Isaac Herschel and Anna Ilse Moritzen. Isaac was a musician while Anna was illiterate and vehemently opposed the education of girls, believing they should work only at home. Anna objected to Isaac’s attempts to educate his daughters – even opposing violin lessons. Caroline suffered smallpox at age 3, leaving her face marked. At age 11, she suffered typhus, stunting her growth. Her father and mother believed it would be difficult for Caroline to find a husband. Her mother decided Caroline would become the family’s domestic servant. Caroline’s brother William moved to the English city of Bath, where he become a church organist, performed in concerts, and taught music. William wanted his young sister Caroline to have a better life than as their mother’s servant. He proposed to his family that Caroline should come and live with him in Bath, train to be a singer, and give concerts with him. In August 1772, William returned to Hanover and took Caroline with him to Bath, having agreed to pay his mother for a servant to cover Caroline’s many household chores. Life in Bath was not easy for Caroline: she was poorly educated and spoke little English. She did housework for William, who taught her English and mathematics. Breakfast was always taken with a math lesson. William gave Caroline singing lessons – two or three a day. She took dancing lessons, and by 1777, age 27, she was a notable soprano singing the lead in works such as Handel’s Messiah. Caroline and William Herschel. The Herschels’ telescope lenses were ground at their home. Here William is polishing a mirror and Caroline is applying lubricant to help the grinding process. However, William’s passion for music was decreasing and his passion for astronomy was increasing. He felt driven to understand the heavens better than anyone before; he wanted to see objects so faint that nobody had seen them before. To achieve his goals, he needed the greatest telescopes in the world. The only way to get these was to build them himself – a remarkable endeavor for an amateur to consider, never mind tackle. William became so obsessed with his goals that, in addition to helping him grind mirrors and lenses, Caroline often had to prepare food and feed it into his mouth as he worked! In March 1781, William discovered Uranus. Since prehistoric times, our ancestors had known Mercury, Venus, Mars, Jupiter and Saturn. Herschel’s discovery of a new planet was a singular moment in the history of science: if a planet had remained unrecognized for so long, what else might be out there? After all, Uranus was actually visible to the naked eye! Artist’s impression of the discovery of Uranus. British scientists petitioned the king, asking that Herschel be paid a government pension to allow him to give up music and devote his life to the construction of his magnificent telescopes offering the possibility of making further stunning discoveries. The king agreed and William became a full-time astronomer. He assumed Caroline would also be happy to give up her musical career to act as his assistant. By the end of the following year, Caroline had discovered four comets, and she felt much happier. To be the first human to see these remarkable objects inspired her. 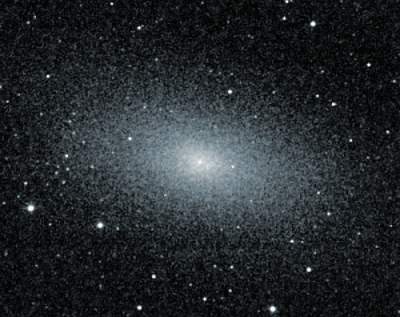 During her career, Caroline discovered or co-discovered eight comets and 14 nebulae, including, in 1783, the Andromeda nebula’s companion Messier 110, also known as NGC 205. Messier 110, a nebula discovered in 1783 by Caroline Herschel. Nebulae – clouds in space – remained mysterious until the 1920s, when Edwin Hubble established that they are galaxies. In 1788, Caroline discovered the periodic comet 35P/Herschel–Rigollet. 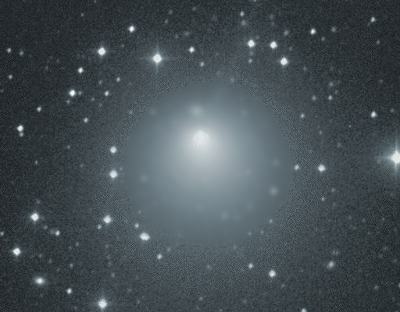 This comet will return in 2092. In 1795, Caroline rediscovered the remarkable Comet Encke, a comet on a 3.3 year orbit of the sun. The comet was first discovered by Pierre Méchain in 1786. Nebulae and comets looked similar in the night sky. In October 1783, William finished building a superb instrument, an 18-inch (460 mm) reflecting telescope with 20-foot (6.1 m) focal length. He and Caroline became one of the most formidable teams astronomy has ever known. Night after night, William would systematically observe different regions of the sky, calling out sightings, declinations, and right ascensions of nebulae. Caroline recorded the observations, making the necessary calculations to standardize them for factors such as time, then compiled the data ready for publication in journals. In twenty years of ceaseless exertion, William and Caroline increased the number of known nebulae from about 100 to 2,500. In 1787, at age 37, Caroline began receiving a pension from King George for her work – she became the world’s first professional woman astronomer. 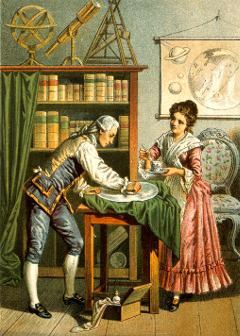 Finding their work badly hampered by errors in the British Catalogue of Stars, Caroline spent almost two years compiling a list of errors, which she published in 1798, earning her the thanks of all the country’s astronomers. At age 75, and in retirement, Caroline learned that William’s son John Herschel intended making an updated catalog of nebulae. To make life easier for her nephew, she undertook a huge reconstruction of the existing catalog so that known nebulae were listed by position rather than class. Her work won her the British Royal Astronomical Society’s Gold Medal in 1828. Caroline was devoted to her brother William, who had rescued her from drudgery and poverty. In 1788, William married Mary Pitt, a local widow, which seems to have made Caroline deeply unhappy. As time passed, however, relations between the two women improved. Caroline doted on John Herschel, the sole child from the marriage. William died in 1822. He left Caroline an annual income in his will, enough for her to live very comfortably. Believing she would soon die herself, at age 72 she sought the familiarity of her childhood surroundings in Hanover, and returned there to live with her brother Dietrich and his family. In fact, she lived for many more years. 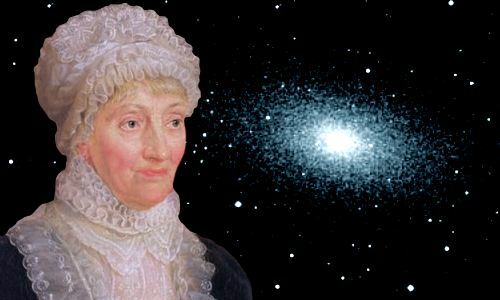 At age 75, her devotion to her nephew John Herschel pushed her into a frenzy of work to produce a reformulated catalog of nebulae. In recognition of the valuable services rendered to Astronomy by you as the fellow-worker of your immortal brother, Sir William Herschel. Caroline Herschel died peacefully, age 97, on January 9, 1848 in her home in Hanover. She was buried, with a lock of her brother William’s hair, beside her parents’ graves in the churchyard of the Gartengemeinde in Hanover. "Caroline Herschel." Famous Scientists. famousscientists.org. 3 Apr. 2018. Web.